Over eight months ago I started this post. Originally it was titled, “M.U.S.C.L.E. is Dead.” Everything I wrote was just too negative. It read like a furious internet troll had written it. The post was becoming unintentionally comically melodramatic. The post was scrapped. A month later two pictures inspired me to try writing the post again. I got closer to finishing the post, but it was still unfinished. Then the website went dark for quite a period of time. When UofM was running again I had a 75% complete post but it felt too late. By this time, I had even seen the MOTU figures “out in the wild.” The Masters of the Universe M.U.S.C.L.E. figures (and even some additional lines) had already occurred; my window had closed. Then Professor Terry submitted MMMM #79. It gave me permission to talk about the “new” M.U.S.C.L.E. figures. When I first saw the MOTU figures by Super7 I instantly hated them. It was more personal than that, I was personally offended by them. That’s why I never said anything. I realized my thoughts were completely irrational and indefensible. The MOTU figures were objectively mentioned a few times in the Epilogues, but I still couldn’t articulate my opinion. I started to settle into my rule of not reviewing a figure that isn’t in your hand. But that was just avoiding the subject. By dodging it I was never going to solve why I didn’t like the figures. The MOTU figures continued to appear in my Instagram feed. I started to realize I didn’t hate the figures. I didn’t even dislike them anymore. I didn’t feel much of anything about them. That was when I started to feel like I understood my reaction. I have a deep emotional connection to M.U.S.C.L.E. 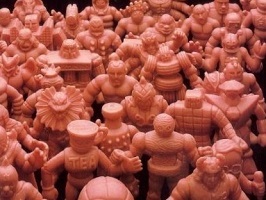 figures and the childhood emotions that M.U.S.C.L.E. provides me. I believe that’s why custom M.U.S.C.L.E. figures that are too violent or too adult-themed really bother me. Understanding that connection has allowed me to be free of needing to own figures. It has also helped me understand why lying, and all disingenuous behavior, has always bothered me so much in the M.U.S.C.L.E. community. That understanding finally gave me the language for talking about the Super7 M.U.S.C.L.E. figures. There’s nothing wrong with Super7 figures. They have increased detail. Arguably the figures are an improvement over the original M.U.S.C.L.E. figures. But they will never be my childhood M.U.S.C.L.E. figures. And that’s ok. I like to think that M.U.S.C.L.E. has been rebooted. That is the most accurate analogy for me. King Kong is the reboot I think about. It has happened several times and will probably happen in the future too. There’s nothing wrong with the new ones. Technology advances with each incarnation, but the original is groundbreaking and special in a different way. Improvements can be made, but a certain love is always reserved for the original. It’s easier to accept those reboots because I don’t have an emotional connection to King Kong. I think that’s why some people had such a meltdown over the new Ghostbusters movie. Some people have that emotional M.U.S.C.L.E. connection to Ghostbusters. No matter how good or bad the new Ghostbusters movie was it will never match the original. If they rebooted Star Wars, then I would probably have a somewhat similar reaction. Moving forward I’m curious to see what Super7 will do with the M.U.S.C.L.E. brand. They seem to create very solid keshi figures that don’t need the M.U.S.C.L.E. brand. But having that minifigure brand certainly doesn’t hurt business. I will never have an emotional connection to the new M.U.S.C.L.E. figures, but I will be interested to see how the reboot continues. Looks like UofM might need a new Anthropology section. Anthropology 300? This entry was posted on Wednesday, October 5th, 2016 and is filed under Anthropology, UofM News. You can follow any responses to this entry through RSS 2.0. You can skip to the end and leave a response. Pinging is currently not allowed.